In 2007, Elaine Brouwer unpacked some important ideas on assessment in the pages of the Christian Educators Journal. It was a remarkable article. One concept from that article has remained front-of-mind for me over the years: Assessment is best done with students, and when it is, it can be a blessing. The idea of assessment with students means giving over some of the traditional responsibility of assessment to students themselves, a process often referred to as peer and self-assessment. Assessment, simply put, is the process of gathering information about learning. Peer and self-assessment requires teachers to believe that students are capable of receiving and acting on this information. 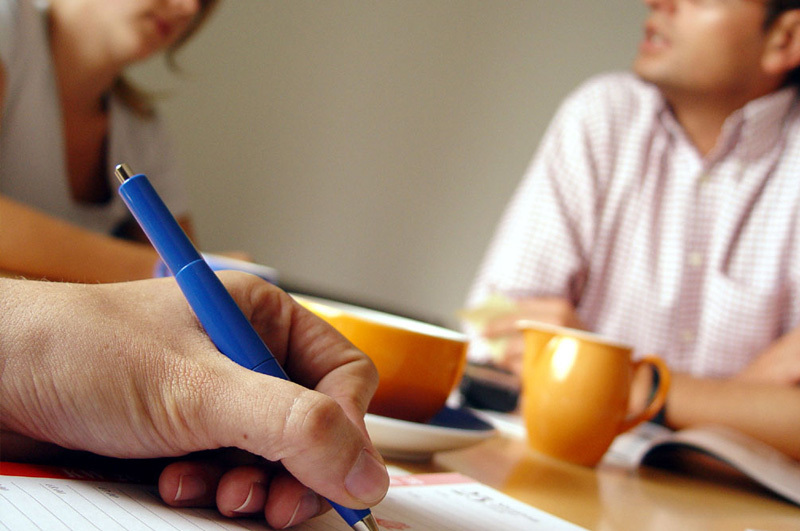 There are many strategies available for peer and self-assessment. Teachers need to make decisions in the specific context of their classroom, guided by policies established by their individual boards and administrators. Not all techniques and strategies fit equally well in every context. We need a framework that can be used by teachers in their decisions about assessment within their particular context, whether that is assessment of/for/as learning or teacher/peer/self–assessment. In this article, I explore an assessment framework that I have found helpful in my own practice. It is rooted in a restorative practice paradigm, one that combines transparent expectations for learning with appropriate and flexible supports. Following this, I discuss some ways in which I have sought to implement this framework to increase the effectiveness of peer and self-assessment with my students. I have frequently used the term restorative assessment in my B. Ed. classes. This term is rooted in a very basic understanding of restorative practice. According to Amstutz and Mullet, restorative practice is a “long-term process that hopefully leads our children to become responsible for their own behavior” (10). Ultimately the focus is on teaching students a process by which they see their actions in the context of community and then respond appropriately when conflict occurs. 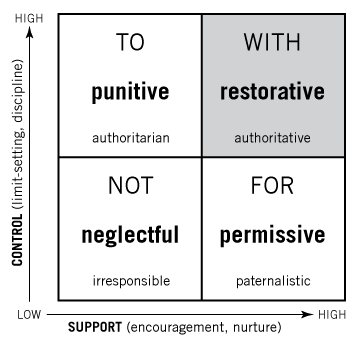 Wachtel offers a helpful matrix to understand restorative practice. By aligning levels of behavioral control—found in the form of limit-setting or behavioral expectations—with support, Wachtel illustrates different forms of discipline. Low expectations accompanied by low support create a neglectful environment. These same low expectations when met with high levels of support create a permissive environment. When high expectations are met with very little support, a punitive environment is created. Finally, Wachtel arrives at a restorative environment, where high expectations are met with high levels of support. 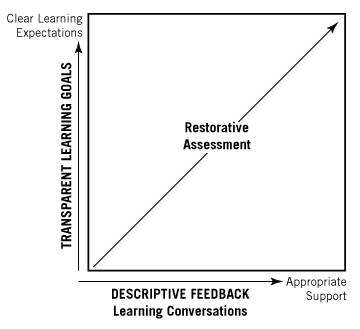 Using Amstutz and Mullet as a starting point, I propose the following: Restorative assessment is a long-term process that leads students to become increasingly responsible for their own learning. With this definition in mind, I return to Wachtel’s grid. It is not my purpose here to discuss what neglectful, punitive, and permissive assessment might look like (although there may be a need for such a discussion). Rather, I would like to turn our attention to the top-right corner of Wachtel’s grid, where teachers take an authoritative stance while assessing with their students. In this quadrant, I reimagine the vertical axis as clear learning expectations. The horizontal axis is defined as appropriate support. When I consider peer and self-assessment within this framework, the following idea emerges: Peer and self-assessment can be effective when students are very clear about their learning goals and have been taught ways in which they can understand and respond to their progress towards those goals.